The following interview contains major spoilers for Season 2, Episode 4 of Westworld. 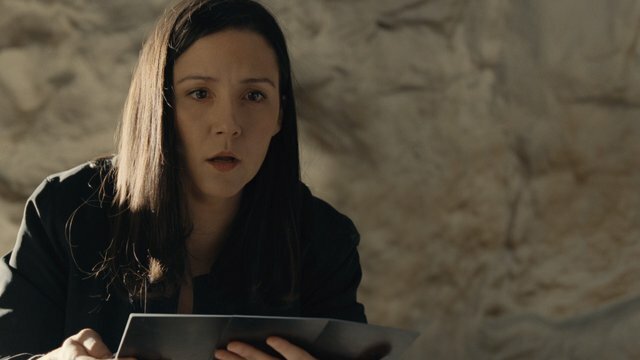 The fate of Elsie Hughes, the plucky programmer played by Shannon Woodward, was a low-level mystery heading into Season 2, so it was a welcome surprise to see the fan favorite's return, albeit in a leg iron, in the fourth episode, "The Riddle of the Sphinx." 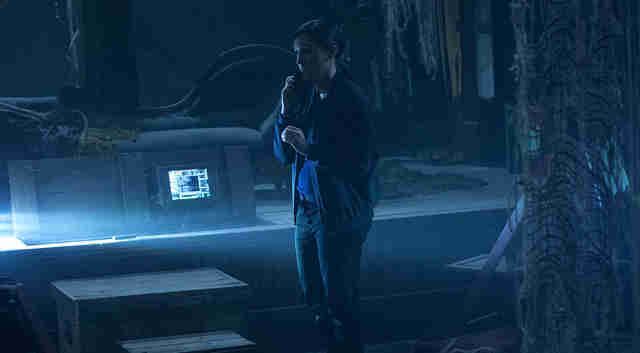 After her unwitting captor, Bernard, freed her and she'd been caught up on the host uprising, poor Elsie's reality check came to a head when they entered a secret research facility and found a malfunctioning host-human hybrid version of James Delos inside. "This particular episode is about the birth of a new species, and two people who were essentially a tag team attempting to be allies and to accept each other," Woodward told Thrillist over the phone. "As fantastical as this show is, I found that profoundly moving." Ahead of her return, Woodward called us to talk about buckets, kisses, and what's next. Thrillist: What was your reaction when you first learned Bernard was going to attack Elsie in Season 1? 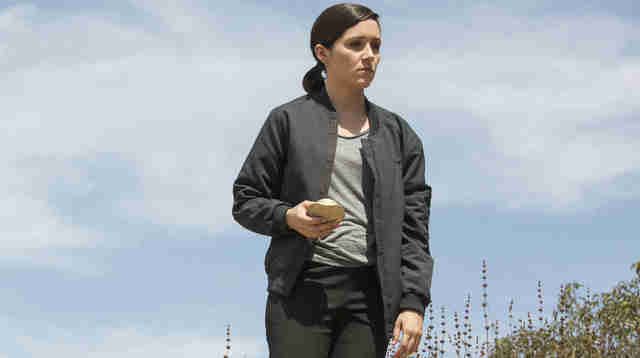 Shannon Woodward: I was excited! Because I knew it was going to be a different chapter for her. I was joking about it, like, "Does this mean I get to be in an action movie after this?" And I was making up funny names for it, like, Girl With the Tramp Stamp Tattoo, and then I think Amy Schumer named her book something like that? And I was like, "Goddammit! That was my bit!" Just kidding. She didn't steal my joke. Anyway, I was excited is what I'm saying. From the get-go, it was pretty obvious she was going to approach a precipice where she was either going to stop all this and there would be no more robot revolution, or something would happen to her. So you knew right away she wasn't going to die? Woodward: Yeah! It surprised me people thought that. I never thought that; I did know I wasn't dead. But it did mean since it waited awhile, story-wise, that it was a secret I had to keep, which was character-testing for me on a personal level [laughs]. It seemed like people were confused with how the first chokehold scene was edited. What went into shooting that scene? What kind of direction were you given? Woodward: I just did it. I had Jeffrey [Wright] put as much pressure on my neck as was safe. Because that scene's in a few episodes, we had a couple directors in there working -- Michelle MacLaren and Fred Toye, both for different episodes. There were two perspectives there: my perspective, and then his perspective he remembers later. So it was a lot of takes, and my neck was very bruised [laughs], but Jeffrey was very careful. Everybody did a great job. We just shot what was on the page: "Somebody comes out from the darkness and chokes her." It was a surprise grab gag, you know? It wasn't overly focused on trying to mock a death. Why would Ford want Elsie alive? Do you think that means Ford has a specific place for Elsie in this new game? Or did Bernard somehow manage to disobey a hit order? Woodward: I don't know! I have that same question. It's unclear. 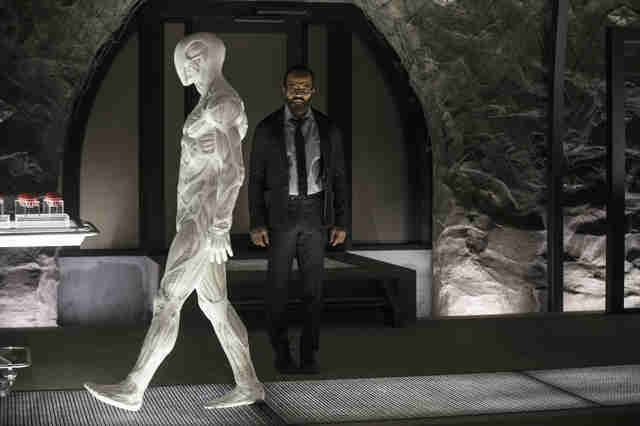 Even with Ford dead, isn't there a chance Bernard could be stuck in a new narrative loop or not in total control? Woodward: She certainly didn't see anything nefarious before, or she wouldn't have stayed around. I mean, she did look at his code. But there's a lot given to Elsie right from the get-go. Bernard's like, "K, I'm back, I'm setting you free, and all this stuff is happening." And she's like, "Wait, what? Gotta go!" I think there are a lot of things she doesn't know the answers to, and a lot of new information is just piling on. In times of massive chaos, you start to take in information and accept it quickly to make the best judgment calls. I think that's what Elsie's doing. And also, I gotta imagine, she's very thirsty! Truly, she's been in that cave a long time. I'm worried she's dehydrated. Bernard gets cortical fluid. Can Elsie get some water? Yeah, I imagine she hates protein bars. Is that where she went to the bathroom? Yikes. Do you understand how many days are supposed to have passed? Woodward: I did ask this, and I did know the answer, but I don't remember exactly. People have asked me this, and I'm just worried that the genius Reddit people are going to be like, "Uh, that's not how many days." Dammit! I don't want to get attacked on the street about this, Sean. That's a question Lisa and Jonah know. It's not more than a month, but it's not less than two weeks. It's a significant amount of time, but not an eternity. What she eventually discovers, with James Delos, is horrifying. How was shooting that scene? And why was Elsie so hesitant to pull the trigger? Woodward: First of all, she doesn't know what [Delos] is: human or host. But if she kills a human, that's murder. There's a lot happening, and I think in that moment she just couldn't do it. She's scared, she's trying to scare him off, and she freezes up. That scene was a whole day -- a big day. It was really surreal. That red light, it flashed whether we were rolling or not. It was red light for 17 hours. Womp, womp [mimicking klaxon]. So it really did start to feel like a fever dream. Peter Mullan is incredible, and his moment was really eerie and bizarrely moving. Bernard killing Delos felt like a mercy killing. There's also a trust-building element to that, of Bernard protecting Elsie after what happened in this weird, hellish landscape where this creature wasn't a human or a host. Yet Bernard is a host, and I'm a human. There's so much there that it just felt quite dense and poetic and scary. At the end of the episode, we see Bernard promise not to withhold any more secrets from Elsie -- but he does. How does Elsie feel about Bernard now? Woodward: I find this whole arc with Bernard and Elsie, personally, moving. This whole show has these elements of great novels, and their journey, in particular, has elements of that that truly resonate. At the end of this episode, I think Elsie feels that he has protected her, that he has proven to her that he wants to help, that they do currently have coinciding goals, and that Bernard is her friend. I think she wants to be able to trust him, but knows there are things beyond his control. Elsie’s a lot of things, but she’s not stupid. There’s a bonding at the end of the episode, I think, that they’ve gone through something together and she decides what she says, that she’s always trusted code more than people. And she can read his code. But don’t the humans write the code? Woodward: Just in general, I think it’s a euphemism for her trusting a host over a human. She’s willing to give it a shot. Does she have any remaining loyalty to Delos, the corporation? What is her goal this season? Woodward: One of the more interesting things about Elsie is that from the get-go, she defied Bernard. She saw the problems that he was constantly skirting her away from, and in hindsight, there was a reason for that -- she was always right. In Season 1, Episode 2, for example, they want to retire Maeve, and Elsie goes rogue and brings her in and fixes her emotional acuity and adjusts her because she has an empathy for that. "There’s nothing wrong with you, they’re just doing it wrong." So in terms of loyalty, I don’t think she was ever loyal to the company, as much as she was loyal to her own curiosity -- like, Hey, there’s a problem here, and it may not be in my job description, but I can fix it. That’s one of the things I love so much about the character -- that they decided to make this character a young woman. I think that [kind of role] is so few and far between, especially when talking about tech. I love that there are people who are watching this show, starting to see representation of a young woman being the only one who would have been capable of stopping the robot revolution. So, coming into Season 2, she’s been kicked down and abused for doing this. Elsie isn’t just marching to the beat of her own drum, she’s making her own drum. She’s in a world where it seems like everyone’s crazy and everyone’s priorities seem to be self-serving and incredibly dangerous. She wants to do the right thing. Elsie always wants to do the right thing. Unfortunately, she might be a little late stopping the robot revolution. What’s does the "right thing" mean for her now? Woodward: I think what she knows is what happens in that last scene, where she’s like, "Was [Delos] a human or a host?" And Bernard's like, "I think it was both." And she puts it all together, and says, "They're going to get us all killed so some rich assholes can live forever!" She realizes that it means everyone in the park is gonna die, so they can save whatever this technology is that they're trying to build. All she knows is that that's not okay. So she wants to go to the Mesa, contact the mainland, and just shut this all down and save whoever's left. That's her immediate goal -- to get them out. Woodward: Could you imagine if I told you? Woodward: [Laughs.] It's a big mystery. They've never told me. I have my guesses, but I'm not gonna tell you. I don't want to get in trouble if I'm right. Fair. Maybe you can help us understand something else. There was a brief moment in Season 1 where we saw Elsie kiss Clementine. What was your takeaway from that scene, and is that a moment that could come back in some way for Elsie in Season 2? Woodward: No, not at all. The scene originally had a line in it where Bernard was talking about how much time they spent on part of her lip, to make it the softest thing in the world. And when he leaves, she's just like, "Prove it." It was kind of just an off-handed thing, but some of that scene was cut, so what I thought motivated that [kiss] isn't in the scene anymore. Frankly, I don't know what that scene means right now. There's a softness to it. She has no intention of abusing the host. But that's one of the more interesting things about filmmaking -- this is a collaborative effort. The performance is not mine after I give it. It's paint, and they're making a painting. When I did it, there was no emotional drive behind it. It was certainly gentle, but not at all loaded -- and definitely not sexually driven. Things change when edits change, so I definitely don't want to take that away from anyone. Representation is strong, I'm glad that that moment's there, I think it's a beautiful moment -- I just never found it to be indicative of Elsie's sexuality. I actually think one of the more interesting things about her character is it doesn't matter if she's male or female -- none of her storyline is driven by her gender. I really like that. It's something that men get to do all the time; women, their characters are often dictated by misogyny. One of the things I also like about the show is that sexuality and those things are what they are and they're left there. To me, in my mind, I'd like to imagine that one great thing about this future, of all the things, is that people just seem to do what they want, sexually. Their identification does not become an A-story. It's just like, Yeah, they did that. What's the problem? I like that. And in no way do I mean that to take away from the importance of LGBTQ representation; it feels like a future where everything feels accepted. I like that notion. What else can we expect from Elsie this season? Woodward: Bernard and Elsie are about to set out together, and this is a journey into the unknown. She's decided to allow him to come with her on her journey, knowing that he may be a danger or a liability, but she's willing to give him the benefit of a doubt. Elsie is, to some extent, an expression of what I think are the best qualities of myself. So to know that she's going into vulnerable territory sends me into a very nervous panic.